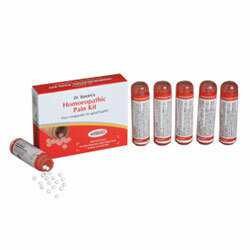 Bakson's Homoeopathic Pain Kit Treats Pain, Headache, Neck & Back Pain, Sciatica & Joint Pain. For acute and chronic pains in muscles and joints of limbs and back as seen in various Rheumatic disorders. For pain due to Cervical and Lumbar spondylosis besides other Rheumatic pains. For shooting pain & numbness in legs due to nerve compression or disc prolapse. For painful, swollen and stiff joints as seen in Arthritis. In acute/severe cases 4 pills every 2 hours, 6-8 times a day, may be taken.